Cryptocurrency industry offers a whole lot of different opportunities. You can invest, you can trade, and you can mine. The problem with the latter option is that, due to the popularity of various coins and their mining difficulty, you often need to make a serious investment in your mining equipment in order to become a miner. Even after that, there are some things you need to worry about like energy consumption and the heat coming out of the rigs. However, there is a simpler way to do things. You can simply hire a company to do the mining for you, and in this NuVoo Mining review we will introduce you to one such company. Interested in the concept? Then keep reading because these guys are among the best in this business. 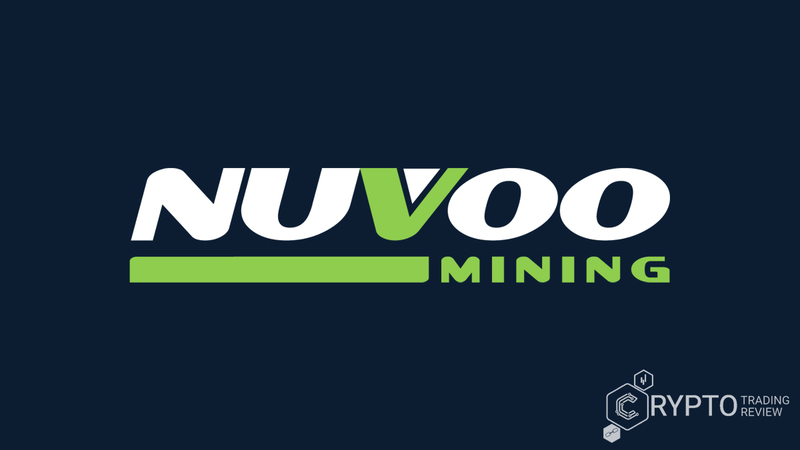 NuVoo Mining is still a fairly new company, given that they only started operating in 2017, but thanks to the quality of the service they offer, they are already well-known across the crypto world. The company hails from Canada, although they have an office in Cyprus, too. Because of their origins, they offer impeccable support service in English and French languages, and they are particularly focused on helping people enter the mining industry. However, they also have some very interesting options for companies and people who want to take their mining to the next level. Efficiency is the name of the game here, and we will explore how these guys achieve it in the rest of our NuVoo Mining review. For now, suffice to say you will be dealing with a very reputable company which has received a huge amount of positive feedback from all types of miners. But let’s dig deeper. As soon as you get to the company’s website, you will notice how well designed it is. You won’t have any problems finding your way around here, plus you can check how the prices are doing as soon as get to the website. The amount of information heading your way is just right, and you are even notified of recent purchases, which is a nice touch. So, everything looks good and you want to create your NuVoo Mining account. How do you do that? Simple, just click on the Register button in the top right corner and you’ll be taken to the registration page. There you fill out a fairly short form containing your personal information and create your username and password. What is interesting to note is the fact that you can register from your Google, Facebook or Twitter account, which makes the whole process even faster. Once you register, you will also become eligible to receive e-mails containing the latest promotions and all other information about your account. This is pretty handy because it keeps you in the loop and makes sure you don’t miss out on anything. But you can also get a very interesting NuVoo Mining bonus. More on that in the next part of this analysis. When you’re creating your account here, you will notice a field called “Referred by”. This immediately tells you that there is some sort of NuVoo Mining bonus to be won. However, we are not talking about monetary bonuses in this case. The system works in a different, probably more interesting way. You see, if you refer someone to this broker, you will be rewarded depending on how much hashpower the person you invite purchases. You don’t get money, though, but your own hashpower increases by a certain percentage of the contract your friend acquired. There are five levels to this, with the lowest giving you a 1% boost and the highest giving you a 5% boost. But that’s not all. You can also get a significant NuVoo Mining bonus depending on the level your account is at. All miners start out as Bronze account holders and then work their way up the ladder. Now, this is a point-based system, meaning you need to collect those to improve your status, but this really isn’t very hard – all you have to do is mine. Depending on which type of contract you invested in (more on those later), you will get a certain amount of points every day. Once you have enough, you will be promoted and receive various perks with your promotion, such as an additional boost to your mining power, for example. But apart from various types of NuVoo Mining bonus, you can choose between various types of mining, too. The offer here is becoming pretty diverse, wouldn’t you agree? Continue with our review to discover more. There are actually three different types of mining you can invest in on this company’s website. The first one is the standard form of cloud mining – you buy a contract, mining is done on your behalf and that’s pretty much it. Very simple and very quick to set up. But after that things start to get interesting. You see, you can also invest in something called dedicated mining. This is very similar to regular cloud mining, only in this case you get to decide what kind of miner will do the work. You do this by heading to the company’s store and selecting the hardware you want to use. After that, the company takes over and does the rest. Finally, there is also the option of colocation mining. Through this type of mining, you actually use the equipment with another person who is investing with this mining company. To put it simply, you share the rig with somebody else. It should be said that, apart from these three mining types, you can also choose between three different cryptocurrencies, but more on that in the next part of our NuVoo Mining review. What can you mine with NuVoo Mining? Yes, we are now pretty much at the main part of the article, although there will still be a lot more to discuss after we’re done with this topic. First, allow us to say that the three cryptocurrencies we mentioned earlier are Bitcoin, Ethereum and Litecoin, and for each of them there are many different NuVoo Mining contracts. Litecoin and Bitcoin offer eight different choices, Ethereum has six. All contracts are pretty much the same in all aspects except one – hashrate. The bigger this number is, the more you have to pay for a contract, obviously. It should be noted that all Bitcoin contracts are open-ended, while the other two currencies have contracts lasting exactly 24 months. Additionally, you can see a mining profitability estimation before actually making your choice, which is another pretty nice touch. You don’t have to worry about any additional fees, plus you get a hash power guarantee with your contracts, too. 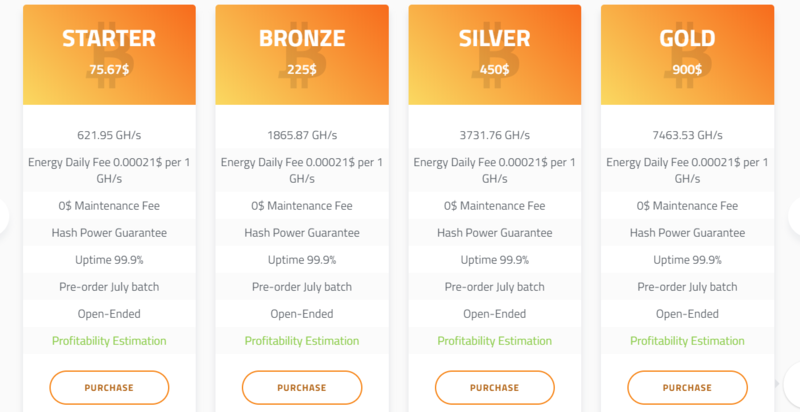 As for the numbers, the lowest price of a Bitcoin NuVoo Mining contract is 250$, which will provide you with 527.08 GH/s. The biggest contract is the Royal contract with 126500.75 GH/s worth 60,000$. Ethereum is between 3704 (10 MH/s) and 26,640$ (72 MH/s), while Litecoin contracts range between 175$ (15.75 MH/s) and 40,000$ (3780.00 MH/s). However, NuVoo Mining contracts often come with a discount, so it can be a good idea to wait a bit if the prices are at their maximum. Getting 20%-25% off can be a pretty big deal, especially if you’re aiming for bigger investments. For example, the lowest price for a Litecoin contract at the moment we’re writing this article is just 125$, so you get 50$ off of regular price. As for payment options, there are several of them you can use. Visa and MasterCard credit cards are available for payments between 100 and 1000 US dollars, for more than 1000 dollars you will need to use bank wire transfers, but it is also possible to pay in Bitcoin. It’s pretty obvious that there are plenty of options to choose from on this website, no matter where you look, but if you need more information, stay tuned. We have much more to tell you. Given how popular cryptocurrency trading has become over the last year or so, you can expect many fairly inexperienced people to come here. To take care of them properly, a company needs to have quality support. That’s what this part of NuVoo Mining review will tackle. There are several contact methods you can use if you need any clarification from the company’s staff. You can send them an e-mail (they always answer within 24 hours), start a live chat or even dial the number of their call centre to talk to an agent directly. The company’s address is also easy to find on the website, so we can safely say there are no obstacles to finding out whatever you need to know. There’s even an FAQ page on the website. People working here are exceptionally well trained and very professional. You can expect quality information no matter how you decide to contact them, which will result in your problem being solved as quickly as possible. In short, even if you don’t know anything at all about cryptocurrency mining, with the help of these people you will get the grasp of the most important terms and concepts very quickly. Don’t let the fact that you’re new at this stop you. There is always someone you can turn to for help. But one question does linger after all of this – is NuVoo Mining legit? Sure, everything sounds really nice, but can you trust these guys to deliver every single time? What kind of security can you hope for here? That’s what we’re about to find out. But are there any more specialized moves these people have made in order to really show that NuVoo Mining is legit? Yes, yes there are. For starters, their data centers are under 24/7 protection, with advanced technology like biometric scanners being used for that. Not only that, but they have also secured UPS backup and additional power sources should anything go wrong in any of the data centers. Add to that the support we analysed in the previous part of this NuVoo Mining review and the fact that we never had the slightest problem, and things become pretty clear. If you need more, you can also get a hold of some feedback from other users. Testimonials on this website are pretty interesting, but no matter where you look the comments are pretty much the same – reliable service and professionalism is what you get when you invest in a contract here. NuVoo Mining is legit, of that there can be no doubt. And that’s pretty much everything we have to say about this company. Hopefully, our NuVoo Mining review has shown why this company is so popular in the cryptocurrency industry at the moment. There are three types of mining you can invest in here, as well as three different cryptocurrencies to mine. However, each of the coins has many contracts to choose from, so you actually have a huge amount of options on this website. At the moment, the lowest contract starts at 125$, which makes investing here quite affordable. It is interesting to note that there is also a very intriguing bonus system you can take advantage of if you bring in friends to start mining with this company. Not only that, but the more you mine the more perks you get. Of course, you always need to be careful where you deposit your money, however these people have proven they can be trusted. The support is always there for you whenever you need some information, plus the security measures taken to protect both you, the website and the company’s mining farms are quite impressive. NuVoo Mining is definitely legit, so don’t be afraid to open an account with them. It’s a great and hassle-free way to start mining.